← Field of Readers on November 12th! In teaching others, we teach ourselves; the best and greatest teach from their hearts. As is our tradition at LME, we take this day to honor and thank the brave men and women who choose to serve our nation’s military. 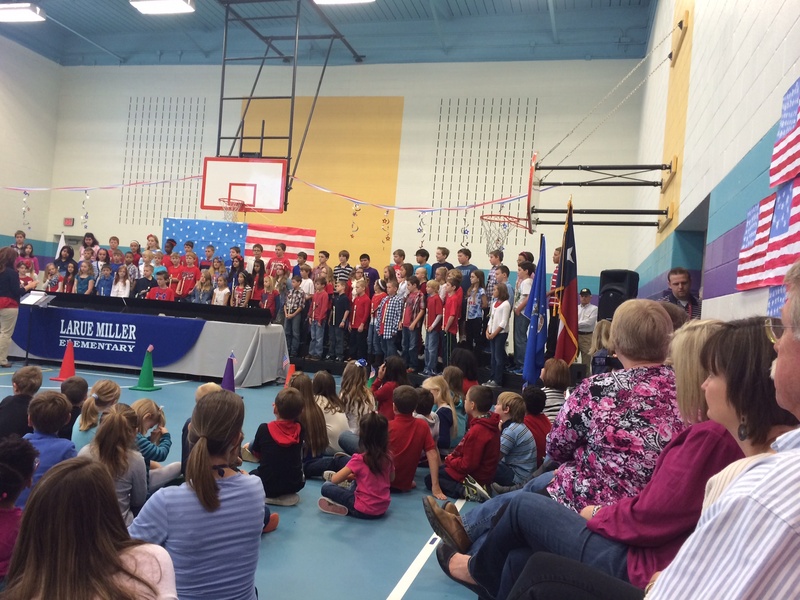 Our fifth grade classes spend great time in preparing historical displays on the branches of military service, preparing scripts and texts, and learning patriotic musical singing and bell-ringing numbers to share. With the entire school decked out red, white, and blue, we gather together to offer our love, support, and genuine thanks to our nation’s finest citizens, our Veterans. 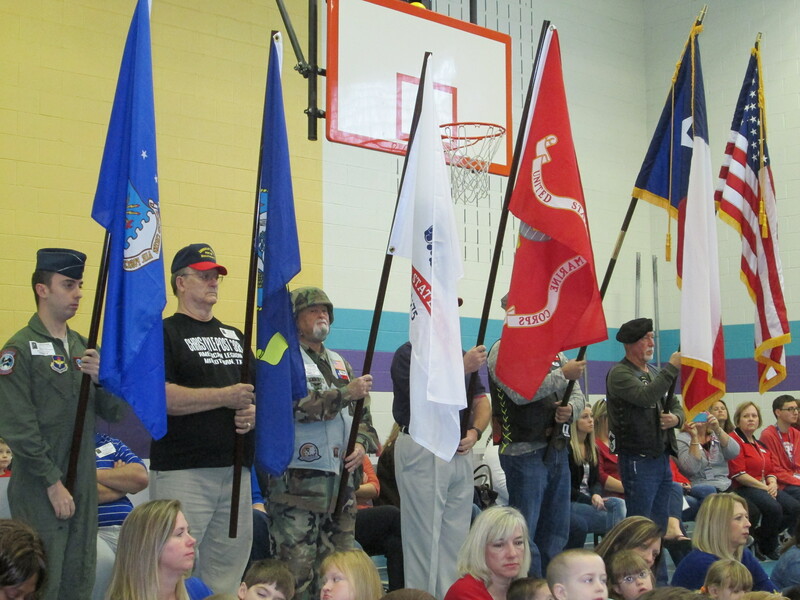 This year, we were particularly blessed to have servicemen from four of the military branches present the U.S., Texas, and military flags at the beginning of the program. Special thanks to Air Force Master Sergeant Joe Cabler, Army Sergeant Doug Schimdt, Marine Corps Chief Warrant Officer Jeffery Grant Sr., Army and Marine Corps Sergeant Ray Maldonado, Navy Seaman Joe Hocker, and Air Force Lieutenant Jeffery Grant Jr., and Navy seaman and master trumpeter Bill Thompson for participating with us! This annual tradition marks an opportunity to remember, reflect, and revisit the service and sacrifices of the brave men and women who have before, who are today, and who will tomorrow give unselfishly of themselves on behalf of our freedom and liberty in the United States of America! Here’s hoping we each stop today (and everyday) to thank a Veteran! This entry was posted in Personal Reflections and tagged branches of military service, celebration, flags, thanks, Veteran's Day, veterans. Bookmark the permalink.